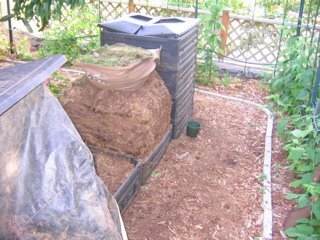 As we move closer to the need for self-sufficiency with food, more people are making their own soil, i.e., keeping a compost pile. Those of us who live on lava can’t afford to avoid it. 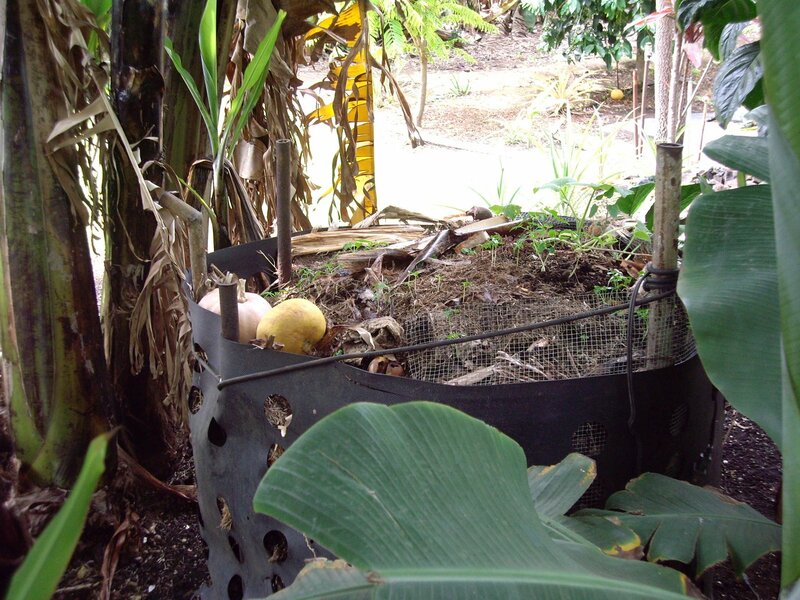 I have several small areas that I devote to composting so I can keep them going for my land. The problem comes with deciding what will go into the compost pile and what I’ll save to feed my hens. My decision is based somewhat on food quality. 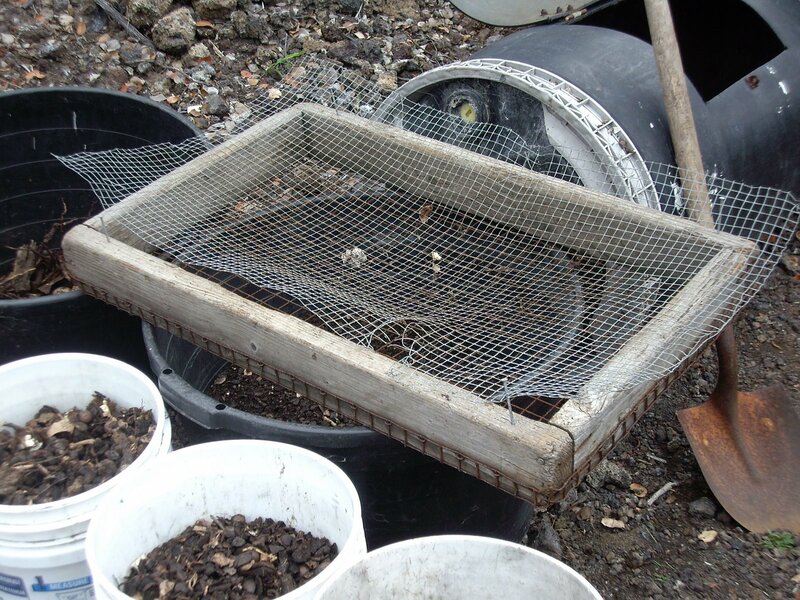 For example, coffee grounds and onions go into the compost; fruit rinds and weeds go to the hens. I had a tiny little compost pile near the back door and eventually decided to start another one. When I took the wooden frame away, I ended up with a nice planting area close to the back door. This will be spread around a bit and I’ll put in seeds. I’ve been reading about “lasagna gardening,” so I wanted to play around with that idea. What I ended up with in this spot is similar to the lasagna gardening, and I’ve decided to try doing the same thing in other places. 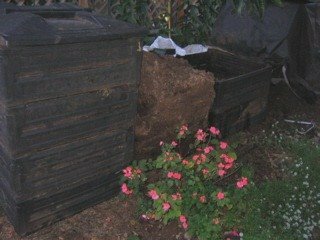 Using the same wooden frame from the original pile, I will place a small compost in various places to create growing spots. You can see that this is just barely started. But soon I’ll have another planting area. Lasagna gardening has been called a “no-till, no dig” type of gardening. 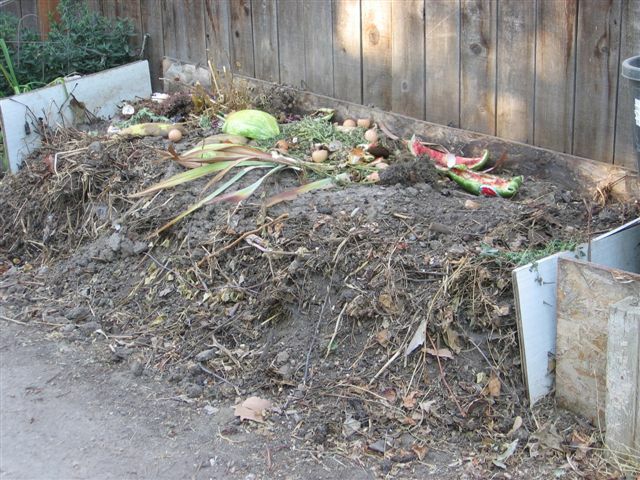 It’s also called “sheet composting.” You simply layer the same things you use in any compost pile. The one ingredient I haven’t used yet, but plan to, is wet newspaper or cardboard as one or more of the layers. That also helps to feed the worms you put into the pile. Because of the chickens, I have a lot of good chicken manure. So I created a place near their coop to put all the shoveled manure and leaf litter. A friend suggested that I put a bag of regular garden soil in the coop. As the girls scratch around in it, it would filter out through the floor of the coop and mix with the manure underneath. I suspect I can have a lot of good soil in a short period of time with this method. 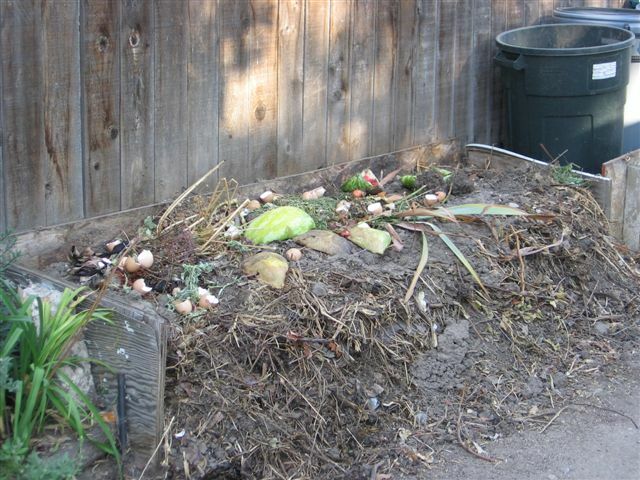 Other friends have created compost piles. Here is one my daughter, Inga keeps in Boise, Idaho. She keeps hers in the alley behind her house. Sometimes she has several going. 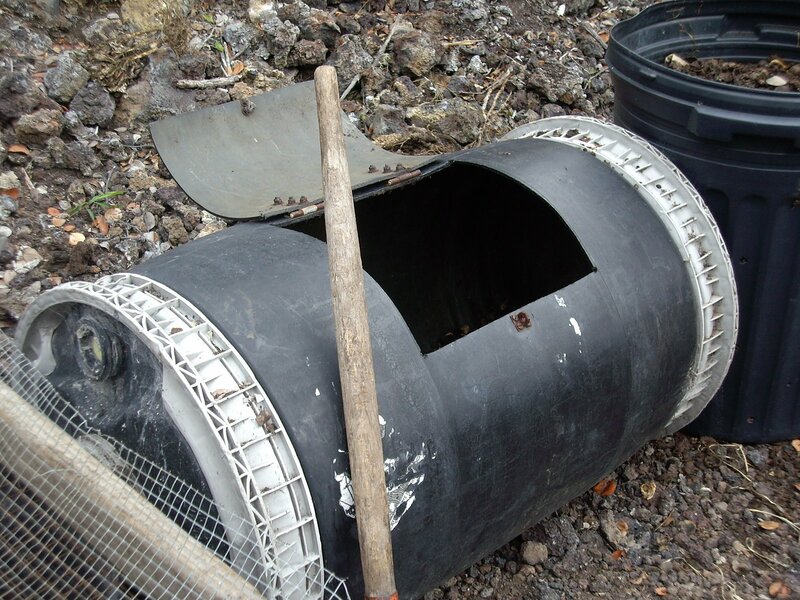 You’ve already seen Albert’s garden, but I didn’t show you his several compost bins. 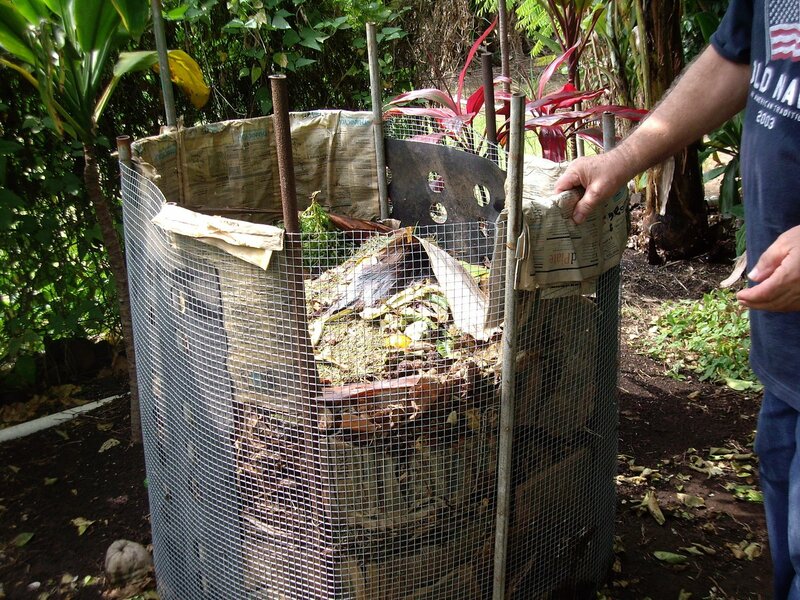 A friend on Maui sent pictures of his compost, a little more sophisticated than mine. The picture at the top of this post is his compost. Here is a shot of the other side. My friend Velvet who raises worms for her compost, guided me around so I could take pictures of her “self-made soil.” She created a progression system. One of these containers holds the kitchen scraps and weeds. Another holds mac nut husks that she adds to the green stuff. The third is the combination. As the break-down occurs, she moves it to the next bin. She did have this tumbler on a wooden mount, but it didn’t last. She will build a new stand for it that is welded together. When all has matured, she sifts it to get out any mac nut husks left and other larger pieces that didn’t break down. 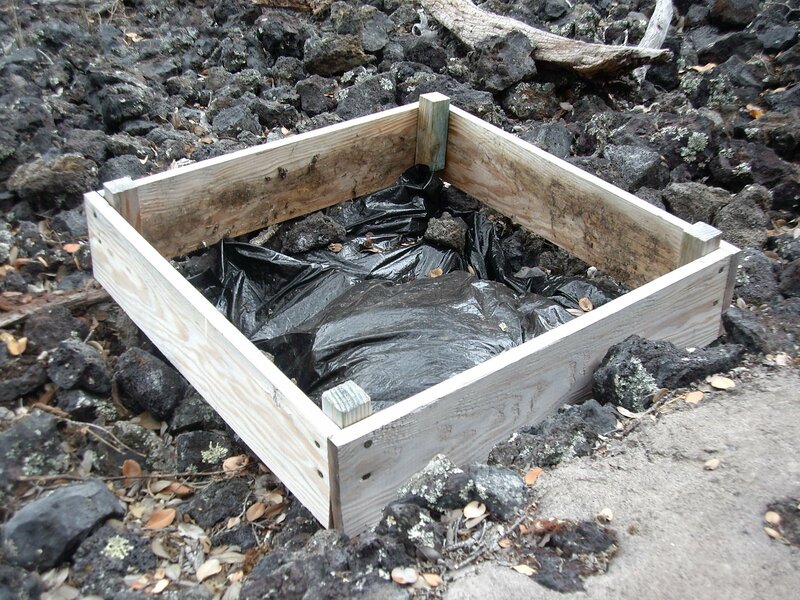 So how do you start a compost pile? Other people might have a different idea, but sometimes when we think we need to do it in a specific way (and surely a more complicated way), it’s easy to put it off. As you can see, everyone has a different way of building one – all very effective. I’m a lot more casual about it, and if you need soil in a place where you want to plant, you might try doing what I’m doing. 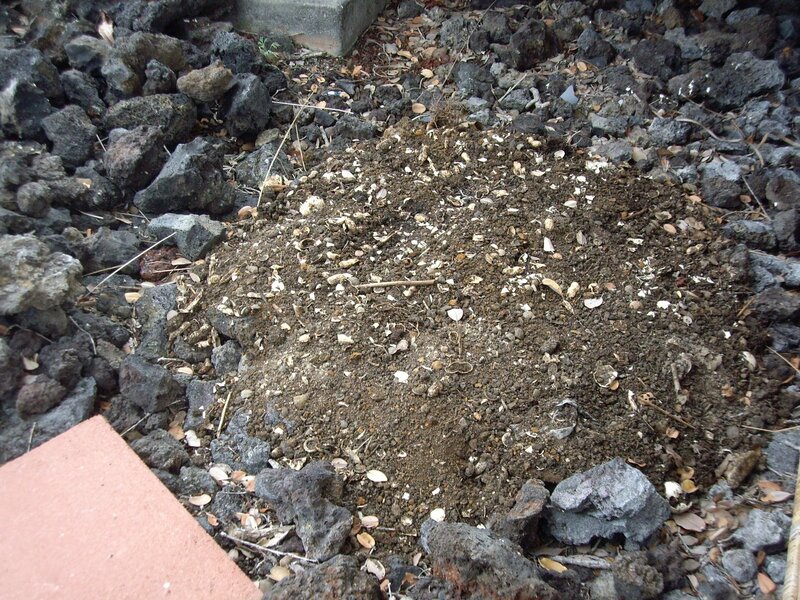 Put a wooden frame or wall of rocks in a place where you might want to do planting eventually. In the past, I have used all sorts of things, like old wooden pallets and old wood-framed window screens. These are great because they let in air. You can add your kitchen scraps, any weeds you gather, leaf litter, shredded paper, egg shells, coffee grounds, tea leaves and so much more. For more information, click here or google “compost” for other ideas. By having several small spots going, I don’t worry about how long it will take, or if I’m doing it “right.” I simply shovel on whatever I think will break down and the chickens won’t eat. 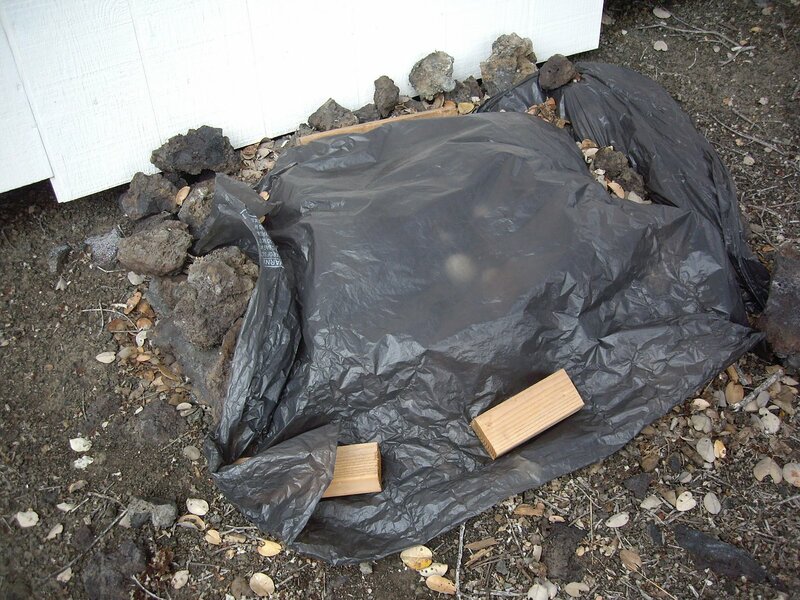 A cover of plastic held down by lava rocks keeps it warm and lets it perk. If I can ever get my head around growing worms I can add their casings to my compost for even richer and faster soil. 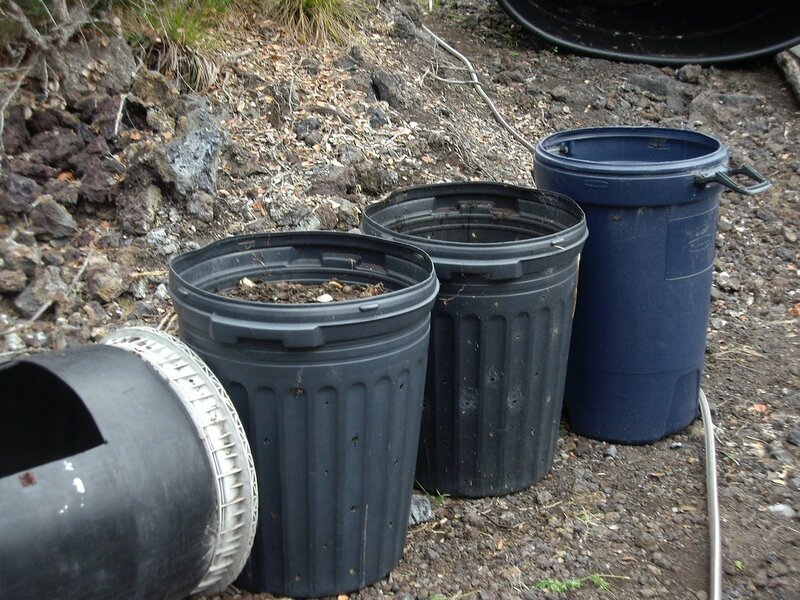 I had just finished writing this post when I found an article called “Composting Life” in my email. It is an excerpt from Present Moment, Wonderful Moment by Thich Nhat Hanh. He explains the spiritual aspect of composting, how everything is in transition, and that we need rich compost from our life in order to grow a more beautiful life. I cannot say it nearly as eloquently as he does. In Hawai`i we say “No rain, no rainbow.” That is what he’s saying, too. We can go through some hard times, but it is like fertilizer for our life, and we can use that to create something richer and fuller. Out of the stinky manure of our lives, exceptional things can take root and grow. A leaf falls and is put into the compost and ends up helping the soil in which we grow our plants. In the same way, I believe that when we fall, we rise again in another place. 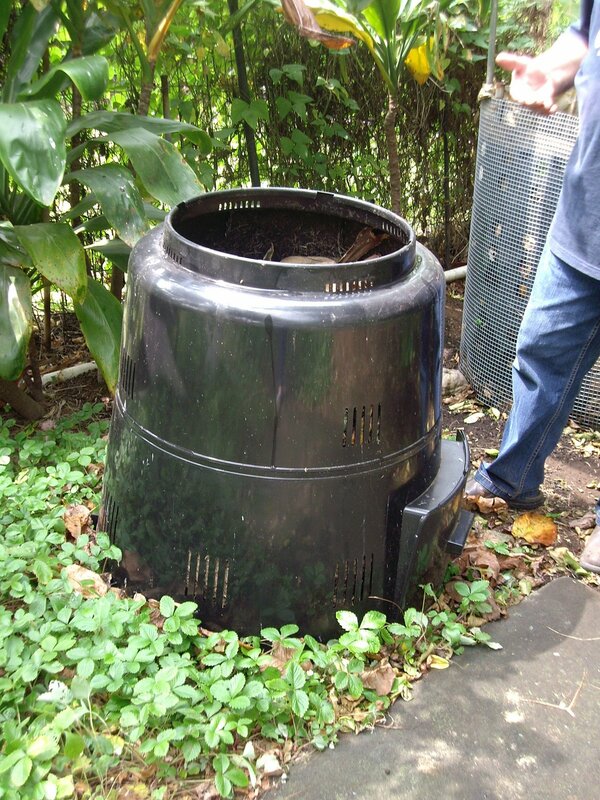 Get started with your composting, and have fun! I’m on my way out to play around with mine!